thebetterbaker.blogspot.com/. I feel very honored and excited to be recognized like this in our BIG blogging world!! Great big XOXOXO's to Marsha!! this fun party. Stop by and tell Marsha that I said "hello". 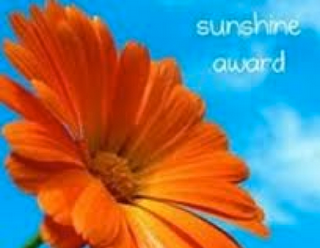 Select 10 of your favorite bloggers, link their blogs to your post and let them know they've been awarded the Sunshine Award! Don't forget to copy and paste the award on your blog! Favorite Color – My favorite color is Red, always has been! Favorite Animal - I think penguins are so funny to watch. Favorite Number - 8 - I guess it's the infinity thing about it! I love hot tea all day. Hmmm, do you think it's my Irish ancestry?! Facebook or Twitter – Facebook, although I don't post much...just not that into it!! Good Book or a Good Movie - I love a good book! I also love reading cookbooks as if they're novels! My Passion - my family and cooking and baking. Giving or Getting Presents - It's always such fun to GIVE and especially MAKE presents! However, getting them is always appreciated. enjoying each other's company, and of course, the great food! Favorite Flowers –I have always loved daisies. They're just so cheerful. These special ladies inspire and motivate me with either their recipes, creativity or kindness and I'm happy to call them my friends!! Congrats, Kitty- you deserve this and so do those other gals you are awarding! Congratulations to you Kitty, and thank you so much for honoring me too! You put a lot of sunshine in the blogosphere! "You know the song YOU ARE MY SUNSHINE", well, you definitely put SUNSHINE in our lives! Congratulations on winning!!! and Thank you so much for picking me as one of the 10. Thank you so much Kitty, it is greatly appreciated :) Congratulations to you as well! We have a lot of things in common...I love to drink hot tea all day even in the summer, Thanksgiving is my favorite holiday, I love daisies (they were my gram's favorite) and I also love to read a cookbook like a good novel! AWWW - very lovely post Kitty. You certainly deserve that award. Thanks for your kind words about me. I sure enjoyed reading more details about you. Hi Kitty.....sorry it has taken me so long to get back to this. Last week was really crazy and hectic, so I forgot to answer. Thanks so much for thinking of me. I'm glad you got this award because not only are you a great person, but I enjoyed learning more about you! Have a wonderful week.